The in situ generation and coupling of glycosyl sulfonate esters of 1-hydroxy gly-cosyl donors has also been investigated in the context of direct dehydrative glyco-sylation. 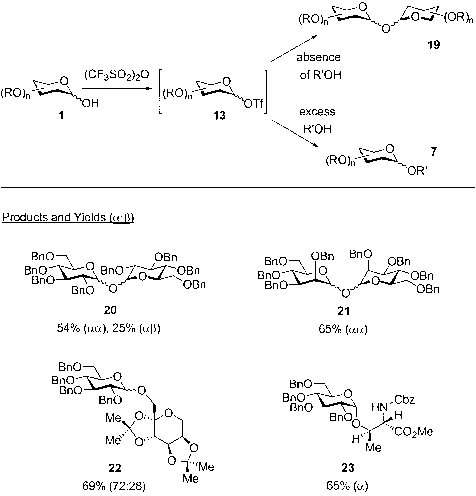 Early work by Leroux and Perlin highlighted the generation of glycosyl trifluoromethanesulfonates 13 as useful reactive intermediates for glycosylation in the presence of Bu4NBr and the acid scavenger s-collidine (Scheme 5) . Their initial attempts at the glycosylation of the acceptor R'OH directly with triflate 13 in the absence of Bu4NBr were unsuccessful (i.e., 1 ^ 13 ^ 7), presumably as a consequence of the instability of the highly reactive triflate species. However, the introduction of Bu4NBr served to rapidly convert 13 into the more stable glycosyl bromide 6, which then proceeds to glycosylate the acceptor R'OH. With this protocol, isolation of the glycosyl bromide 6 is again unnecessary, allowing for an overall one-pot process. The authors also highlight this as a useful method for the generation of glycosyl bromides under nonacidic conditions. Scheme 5 Dehydrative glycosylations via glycosyl triflates . * Using alternate method: (Me2SO2)2O, s-collidine; R'OH. With this procedure, a number of simple alcohols were glycosylated to generate carbohydrate products such as 14-17. With glycosyl donors incorporating a C2-acyl functionality such as an acetate ester, the corresponding orthoester adduct (e.g., 18) is generated, the obvious result of acceptor addition to the bicyclic oxygen-stabilized carbocation that arises through neighboring group participation. It should be noted that the use of methanesulfonic anhydride in place of triflic anhydride also led to similar glycoside adducts (e.g., 14 and 18). When (MeSO2)2O is used as the dehydrating reagent, however, the addition of Bu4NBr is not necessary because the intermediate glycosyl methanesulfonate, which can directly glycosylate the acceptor at ambient temperature, has increased stability. Although the use of triflic anhydride and s-collidine in the absence of bromide ion was ineffective for glycosylation, the use of triflic anhydride alone was found to be useful for the coupling of 1-hydroxy glycosyl donors. 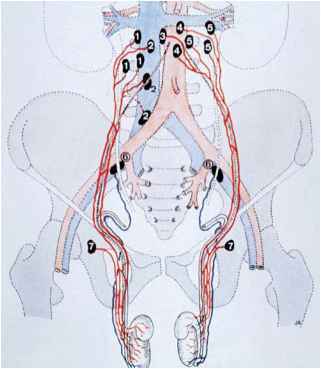 Pavia et al. have shown that the treatment of 1-hydroxy donors with triflic anhydride in the absence of any acid scavenger led to the formation of (1,1')-linked disaccharides 19, the products of self-coupling of the 1-hydroxy donor (Scheme 6). The presumed mechanism  of this transformation involves (1) activation of the hemiacetal with trace amounts of triflic acid for conversion to the glycosyl triflate 13 (or the corresponding oxo-carbenium triflate), (2) the rapid coupling of the highly reactive intermediate 13 with unactivated 1, and (3) the action of triflic anhydride as a desiccant to favor formation of the (1,1')-disaccharide 19. 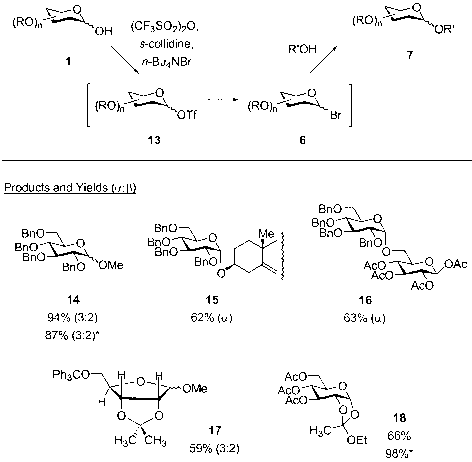 Although this is a relatively efficient method for the preparation of symmetrical trehalose analogs (e.g., 20 and 21), it is often the case that the self-condensation product of the hemiacetal donor is an unwanted side product of dehydrative glycosylation. However, if this coupling procedure is performed in the presence of an excess (2-4 equiv) of an alcohol glycosyl acceptor R'OH, heterocouplings do take place (e.g., 22 and 23). Pavia has used this protocol to prepare complex galactosyl-O-glycopeptides . Koto has shown that glycosyl arylsulfonates can also be used as intermediates in couplings with 1-hydroxy glycosyl donors. The direct glucosylation of several simple alcohol acceptors with 2,3,4,6-tetra-O-benzyl-d-glucose can be accomplished with the ternary mixture of ^-nitrobenzenesulfonyl chloride, silver triflate, and tri-ethylamine as the acid scavenger (Scheme 7) . Simple alcohols such as methyl alcohol, cyclohexylmethyl alcohol, and dihydrocholesterol are glycosylated efficiently via the glycosyl sulfonate 24, and the formation of trehalose by-products is minimized as a result of rapid anomeric sulfonylation. In addition, couplings performed in the presence of jV,jV-dimethylacetamide generally lead to higher proportions of the a anomer (26) . This procedure can be used to prepare glucuronides (27) , as well as other complex oligosaccharides such as the branched-chain oligosaccharides of the sarsasaponins (e.g., 28-30) . Scheme 6 Dehydrative glycosylations via glycosyl triflates [17-19]. such as benzyl alcohol, cholesterol, and even tertiary alcohols such at f-butyl alcohol can be glucosylated with good a-selectivity (e.g., 15, 32, 33).